The US255 ProMaster inserter machine. THE US255 ProMaster is a promotional inserter that places a promotion into a product, thereby advertising the product. Available from Heat and Control Pty Ltd , the promotional inserter places coupons, pouches or 2D objects into the product automatically. This technique is accurate, economic and reliable. The machine’s self monitoring system results in optimal performance and continuous line speeds. 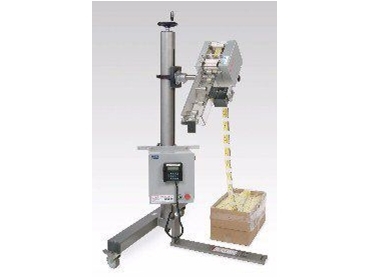 It provides speeds of up to 250 pieces per minute and is compatible with most packaging lines. The US255 delivers accurate and reliable inserting by bursting individual pieces from a perforated bandolier. It has a versatile capacity for over wrapped, non-over wrapped, flat or pouch style inserts. Promotional insert pieces are available from Unique Solutions and with the entire package, from promotional pieces to equipment, customers are guaranteed a 99.5% insertion rate.